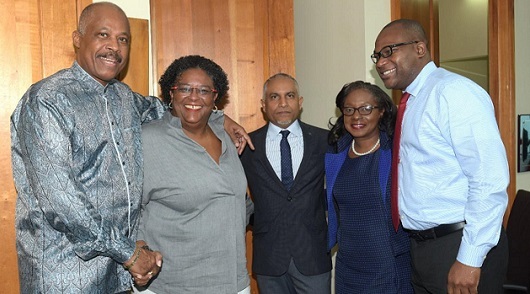 From left: Professor Hilary Beckles, Vice Chancellor of THE UWI; the Honourable Mia Mottley, Prime Minister and Minister of Finance, Economic Affairs and Investment of Barbados; Mr. Ravi Rambarran, Group Chief Operating Officer, Sagicor Financial Corporation; Mrs Andrea McNish, Bursar for The UWI; and Professor Densil Williams, Pro Vice-Chancellor, Planning. 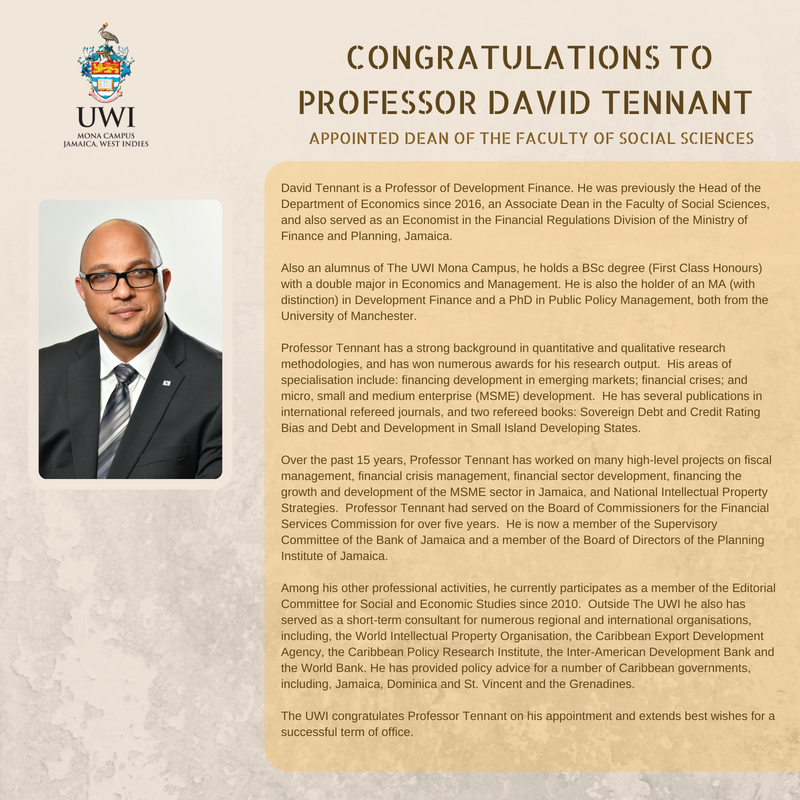 Professor Dale Webber will be formally inducted as Principal of The University of the West Indies (The UWI) Mona Campus at a ceremony to take place on Tuesday, October 30, 2018 at 6.00 P.M. in the Graduation Tent on the lawns of the Senate Building. 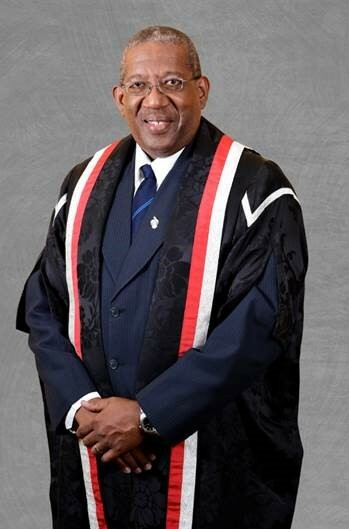 Chancellor of The University of the West Indies, Mr. Robert Bermudez, will preside over the induction ceremony while other members of the University Administration, including the Vice-Chancellor and Principals of The UWI’s other campuses in Barbados, Trinidad and Tobago, and the Open Campus will be in attendance. Representatives of the Government, the diplomatic corps, private and public sectors as well as members of the university community are also expected to attend the ceremony. 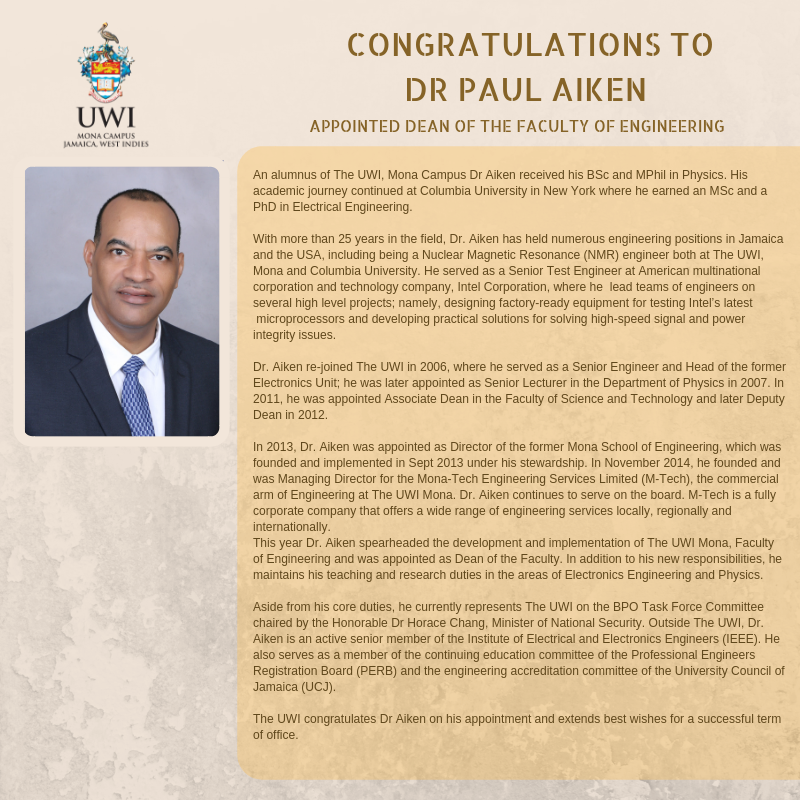 The University of the West Indies, Mona Campus extends warm congratulations to five members of staff presented with national honours by His Excellency, the Governor General of Jamaica, the Most Honourable Sir Patrick Allen. The National Honours and Awards Ceremony was held at King’s House in St Andrew on Monday October 15, 2018. Among the recipients was Pro Vice-Chancellor and Principal of the Mona Campus, Professor Dale Webber who received the Order of Distinction in the rank of Commander (CD). Professor Webber was recognised for his outstanding contribution to environmental conservation. The University of the West Indies (The UWI) has broken into the Times Higher Education (THE) World University Rankings for the first time. The 2019 Times Higher Education World University Rankings has ranked The UWI among the world’s top institutions. The rankings show that The UWI is located among the 1,258 top universities in world for 2019. This puts The UWI in the elite band of the top 5% of universities worldwide based on data showing that there are over 25,000 recognised universities, globally. Specifically, Times Higher Education ranked The UWI at 591 out of the 1,258 universities which made the list. The UWI is the only Caribbean institution on the world-wide list. 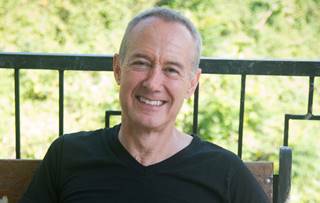 Professor Anthony Clayton, the Professor of Caribbean Sustainable Development, of the Institute for Sustainable Development in the University of the West Indies, has been appointed Chair of the Energy Program of the Inter-American Network of Academies of Sciences (IANAS). The Energy Program is an exceptionally important part of the work of IANAS, as energy policies, practices and technologies underpin all aspects of society today. It is impossible to solve the existential threat of climate change, for example, without developing the new energy policies and technologies needed to support a growing world population. 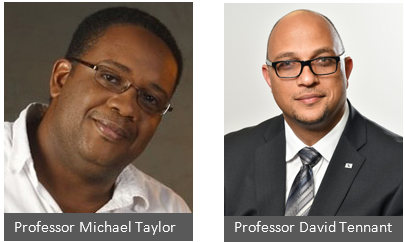 The University of the West Indies (The UWI) Office of Administration is pleased to announce the appointment of two new Deans at the Mona Campus in Jamaica. 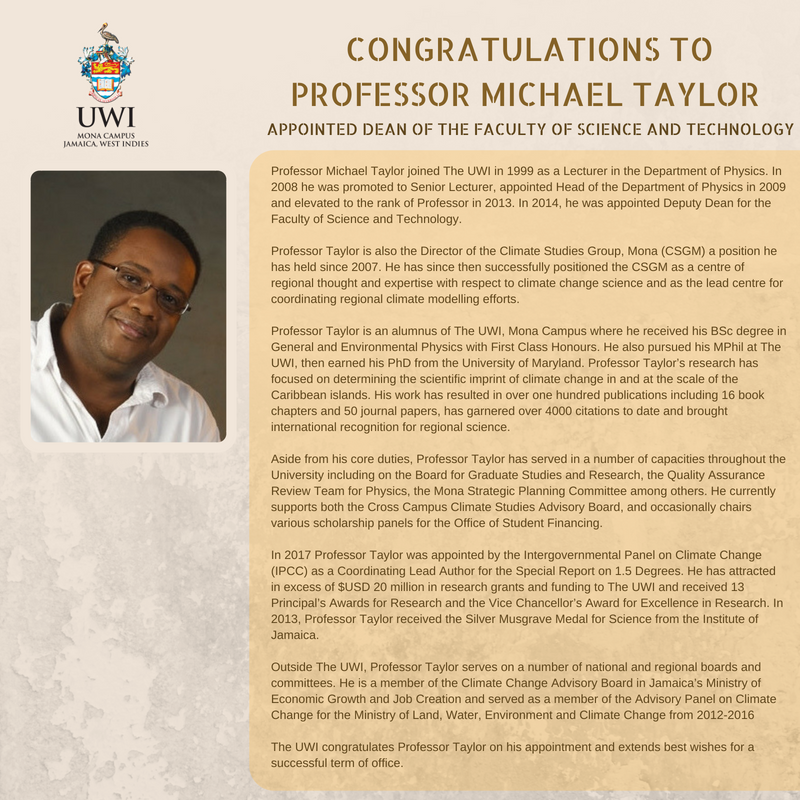 Professor Michael Taylor is the new Dean of the Faculty of Science and Technology and Professor David Tennant is the new Dean of the Faculty of Social Sciences. The new Deans took office on August 1, 2018 and will serve until July 31, 2022.